Fans of banh mi, the Vietnamese baguette sandwich, know to head to Little Saigon or Buu Dien in Chinatown for a bread torpedo loaded with the stuff pork dreams are made of, cilantro, pickled carrots and jalapeño. But Banh Oui in Silver Lake, a stand tucked into a corner of the Hi Tech Automotive auto repair shop, is where you’ll want to head next. It’s a tiny red shack with two chefs serving chicken liver pâté-smeared baguettes stuffed with braised pork belly; shrimp toast covered in a maze of kewpie mayonnaise; and chicken wings and ribs doused with sticky Vietnamese caramel. Bahn Oui is the passion project-turned-full-time-everything of chefs Casey Felton and Armen Piskoulian. The two met at the Tasting Kitchen in Venice, where Felton prepared fish and Piskoulian was the pasta guru. Felton previously worked at Providence and Red Medicine; Piskoulian cooked at Michael’s in Santa Monica. The two ended up in Australia, where they fell in love with the banh mi sandwich. They came back to the U.S. to work at Scarpetta, then decided to open their own business. “We had banh mi out here in the San Gabriel Valley, but nothing to the caliber that they [in Australia] were offering,” said Felton. So they decided to make their own. The name Banh Oui is a nod to saying “oui chef” in the kitchen; banh is the word for “bread” in Vietnamese. The two say they built their business in about a month, then premiered at Smorgasburg, the downtown L.A. Sunday market, last summer. At the automotive shop, owned by Piskoulian’s uncle Koko, the two chefs work in a tiny, makeshift kitchen outfitted with two fryers, an oven and a griddle. Piskoulian braises the slabs of pork belly for the pork belly banh mi until the slices barely hold together, then layers the pork with slivers of cucumber and jalapeño, pickled carrot and daikon, scallion and a handful of mint and cilantro. 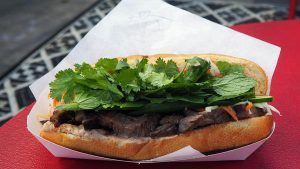 In addition to the pork belly banh mi, there’s a roast beef banh mi with the same traditional accouterments, and on the same crunchy baguette, which collapses into an airy bread cloud when you take a bite. You can also order a sesame panko-breaded fried chicken sandwich on a Kaiser roll, served with bread and butter pickles, pickled jalapeño, garlic pureé and chicken liver pâté. Banh Oui is currently operating with a three-month permit at the auto repair shop, so it should be around until at least midsummer at that location. You can also find Felton and Piskoulian at Smorgasburg every Sunday, and they just secured a permit to pop-up on the rooftop at the Standard, Downtown LA May 15 through June 30. Just don’t expect a standard brick-and-mortar location, at least not any time soon. 4000 Fountain Ave., Los Angeles, www.banhoui.com.